"Whistle if you can hear me." Universal has released a final 60-second trailer for horror sequel Insidious: The Last Key, also known as just Insidious 4, since this is the latest in this on-going horror franchise. It opens in early January just a few days after the New Year, so don't expect much from this sequel. Lin Shaye returns as Dr. Elise Rainier, the brilliant parapsychologist who ends up being terrorized in her own home by the demons that have been haunting houses ever since Insidious in 2010. Shaye is joined in the cast by Angus Sampson, Leigh Whannell, Josh Stewart, Caitlin Gerard, Kirk Acevedo, Javier Botet, Bruce Davison, Spencer Locke, Tessa Ferrer, Ava Kolker and Marcus Henderson. I honestly feel like this horror franchise has worn out its welcome, time to end it, so hopefully this is it once and for all. You can still watch the first two official trailers for Insidious: The Last Key here, to see even more footage. The creative minds behind the hit Insidious trilogy return for Insidious: The Last Key. In the supernatural thriller sequel, which welcomes back franchise standout Lin Shaye as Dr. Elise Rainier, the brilliant parapsychologist faces her most fearsome and personal haunting yet: in her own family home. 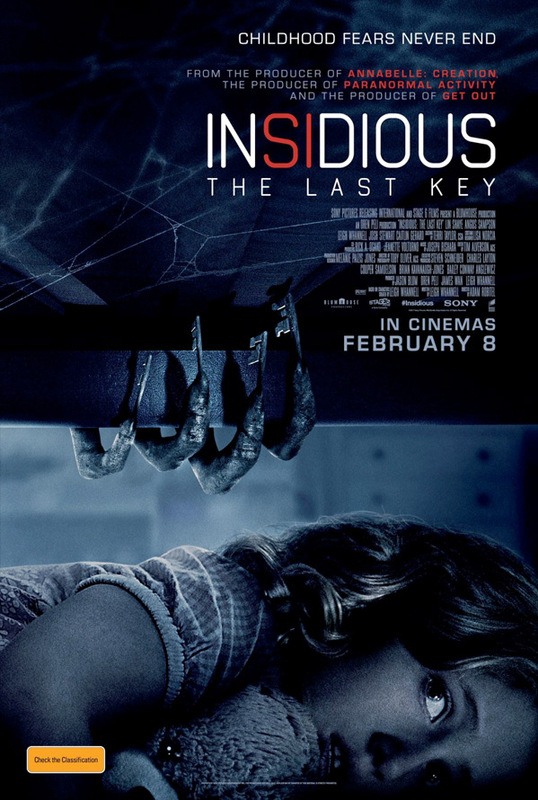 Insidious: The Last Key is directed by American writer/filmmaker Adam Robitel, of The Taking of Deborah Logan previously (and director of The Maze coming up). The screenplay is once again written by co-creator Leigh Whannell, who wrote the trilogy and directed Chapter 3. Universal will release Insidious: The Last Key in theaters everywhere starting January 5th, 2018 at the beginning of next year. Who's still into this series?